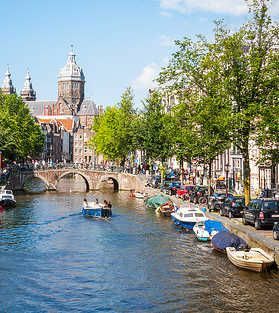 ​The growing number of boats on Amsterdam’s canal system has caused the city council to promote the use of electric powered boats that are quieter and cleaner for the environment. The beautiful system of canals throughout Amsterdam has long been one of that city’s top tourist attractions. The city’s canals have been listed on the UNESCO World Heritage List and many visitors to the city are emphatic in their belief that touring the canals by boat is absolutely the only way to really see the city at its best. However, the citizens of Amsterdam that live in, on or around the canals are not quite as calm as the waters are these days due to the rapidly rising numbers of boats, both large and small, private and commercial. The rising number of boats on the canals is causing problems between the big commercial canal boats and the smaller, privately-owned boats. In response to the growing number of complaints and arguments over the use of the canals, the Amsterdam city council has tried to regulate some of the existing traffic, pollution and noise levels, but many feel the only real answer is to mandate the use of electric-powered boats on the entire canal system within the city. Most of the disagreements have been between the big tourist boats, large commercial boats and the smaller private boats. However, there is also a large number of people who live on the canals in private houseboats who complain abut the growing air and noise pollution generated by the larger boats. Due to the costs involved, the commercial shipping boats and tourist boats have resisted the requests to go to the use of all-electric boats on all of the canals within the city. The Amsterdam city council says it is planning to permit only electric boats on one of the city's main canals later this year, but it has also indicated the electric-boat-only measure could be extended to all of the Dutch capital's canals within the next three years. Compounding the problem is the fact that Amsterdam’s famous waterways are utilized by the tourist canal boats as well as thousands of small motorboats operated by private citizens. The Amsterdam city council says there are just too many boats in the first place, and that their diesel engines are too noisy and too polluting. A few boat rental companies in the city are offering the option of electric boats that are described as being very quiet without exhaust fumes, and they are stable, comfortable, safe and very easy to navigate in heavily trafficked areas. In comparison, the older, diesel boats are noisy and smelly and they are not very good for the overall canal environment either. Another big difference between the old diesel boats and the newer electric boats is that the old boats have outboard motors, while the electric boat motors are hidden inside. The electric boats also employ batteries that are charged with renewable or “green” electricity sources. The new electric boats may not be as fast or powerful as the old boats, but to enjoy the city’s canals by boat you don’t really need a fast boat for sightseeing purposes. The new electric powered boats are also a lot quieter than the old ones, and they are also better for the environment. In a city with a larger tourism industry that desires to promote itself as a “clean city,’ the switch over to all-electric boats in the future sounds like an idea whose time has arrived.